The Penrod Company, North America’s leading diversified distribution company headquarted in Virginia Beach, Virginia, is pleased to announce that the company will be opening a consolidated wood products distribution warehouse in Norfolk, Virginia, for the purpose of better serving their North American manufacturers and distributors. Both customer market channels are and will continue to be important to Penrod’s overall business growth in North America. 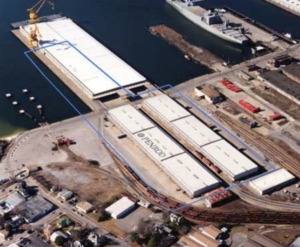 The Penrod Company warehouse will occupy 300,000 sq.ft., located on the waterfront at Lambert’s Point Docks, Inc. in Norfolk, Virginia. This distribution facility will allow faster delivery of product to existing North American customers. Additionally, logistics issues will be streamlined. This facility will have options to ship via van, flatbed truck, inter-modal carrier or railroad at our customers choosing. All Eastern seaboard customer orders will be shipped from this facility, once the warehouse is fully operational. The Norfolk warehouse will stock all top-selling products in ample quantities as necessary to service the needs of PENROD’s manufacturing companies and distributors. With all products available from one East Coast facility in mixed shipments, PENROD will have the ability to provide just-in-time supply to its growing customer base. The current schedule calls for the facility to be completely operational in second quarter, 2002, and product shipping to begin earlier as inventories become available. From its inception in 1888 as a manufacturer of forest products, Penrod has grown to be one of the world’s largest suppliers of forest products, metal and PVC products for the residential and commercial construction markets. With offices in every major region around the globe, distribution centers on most continents, and an efficient trade network, we are an international leader in the industries we service. Penrod is proud to embrace the concept of sustainable forestry as an essential element to our success as a company and as a solidly compliant, responsible global citizen.